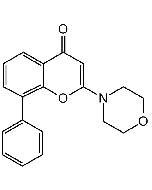 GSK2126458 is an orally available selective inhibitor of the class I phosphoinositide 3-kinase (PI3K) enzymesand MTOR1/2 complexes. GSK2126458 can inhibit PI3K-α (p85α/p110α) with IC(50) of 0.04nM. GSK2126458 has Ki values in the picomolar range for each of the class I PI3K isoforms and MTOR1/2 complexes. 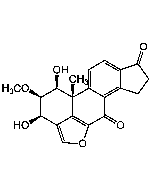 GSK2126458 has potent in vitro and in vivo growth-inhibitory effects on cancer cells. 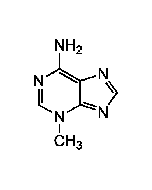 In comparison with other clinical PI3K inhibitors, GSK2126458 is around 100-fold more potent than BEZ235 (6nM). GSK2126458 also a low picomolar inhibitor of the common activating mutants of p110R ( E542K, E545K, and H1047R ) with Ki of 0.008nM, 0.008nM and 0.009nM in human cancer. In mechanistic cellular assays, GSK2126458 caused a significant reduction in the levels of pAKT-S473 with remarkable potency. Consistent with its activity against both PI3K R and mTOR, GSK2126458 also inhibits phosphorylation of AKT-T308 and p70S6K at low nanomolar concentrations. GSK2126458 induces a G1 cell cycle arrest and inhibits cell proliferation in a large panel of cell lines, including T47D and BT474 breast cancer lines.